When he reached his locker after the game, he had 174 text messages on his phone. Then there were messages on social media. The fact that Stripling even got the ball on April 8 in the first place was, insane is not the word, but incredible. Stripling missed 2014 due to Tommy John surgery and returned last June 14 to compete in a game for the first time. Things had to fall in place for Stripling, who still has yet to pitch in Triple-A, for get the start in San Francisco. He was impressive in his first three Spring Training outings, then surrendered three home runs and five earned in his only spring start on March 29. But Mike Bolsinger and Brandon Beachy got hurt. Stripling won the No. 5 spot in the rotation over Carlos Frias and Zach Lee, two pitchers with big league experience. And to throw 7 1/3 innings of no-hit ball? No one expected that. “I think initially, he’s just a great way about him,” said Dodger manager Dave Roberts. “There’s a confidence, just kind of the way he carries himself – his mound presence, when he was working the pens, the live BPs, his interaction with the pitching coach. And obviously, his mix – he’s got great command, he’s got repeatable mechanics. And so I think that when you’ve got those components, and you’ve got a game plan that can execute, you’ve got a good chance. Stripling said he feels good today. He said he was a little fatigued after the game — physically and mentally. The 100 pitches he threw on April 8 were the most since he has come back from surgery. But he was able to throw his bullpen on Sunday, as scheduled and felt strong. Now to the next moment. For fans, and players, one of the most electrifying parts of the pregame pomp and circumstance on Opening Day is player introductions. 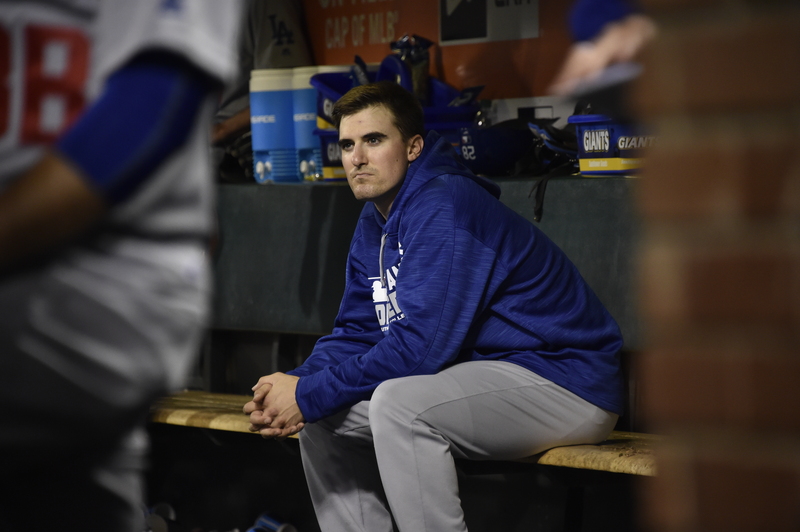 It’s crossed Ross Stripling’s mind as to what the moment will be like when his name is called.